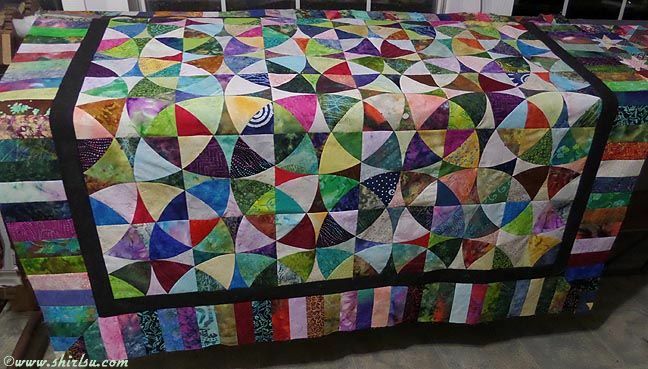 02/09/15 – After hearing from a special person undergoing medical treatments, I began still ANOTHER Winding Ways sofa-size quilt. I need this one as fast as possible so am cutting pieces from batik already on my cutting table. No time to pull new cloth from the stash. 02/20/15 – I’ve been hand stitching blocks as quickly as possible and am only a third of the way finished. Think I’ll abandon hand stitching and machine sew the rest of the blocks. I’ve planned and begun cutting a batik piano key border which will also be machine stitched. I expect this quilt to receive heavy use and multiple washings so machine piecing may be the best bet. 03/13/15 – Putting in long hours of hand stitching each day. Have finished quilting the main body and 2 of the 4 sides of the border. After putting in 17 hours of hand quilting yesterday, my hands HURT so taking some time today to rest as I design the label. If nothing goes askew, I will have this quilt completed, labeled and laundered before the self-imposed deadline. 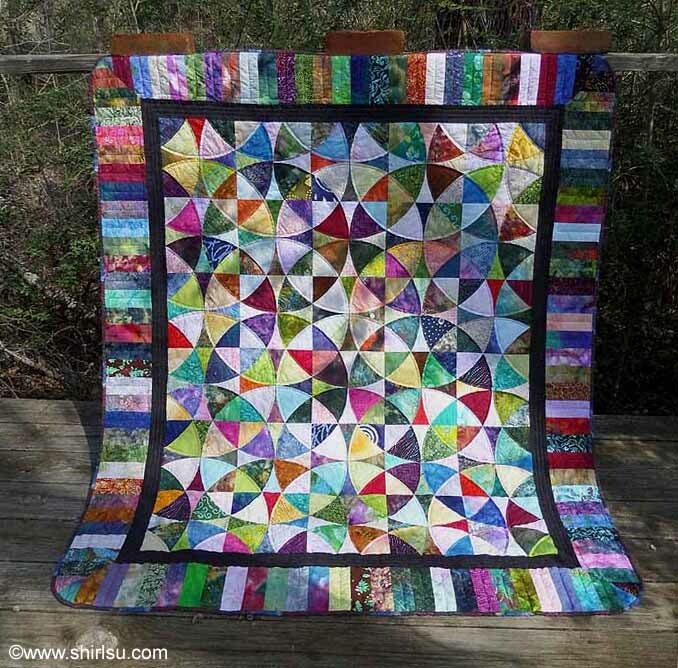 03/22/15 – Stitching is finished!! Binding is on and label is embroidered and attached. All that’s left is hand washing which will be done tomorrow while DH is away at the doctor’s office. Hopefully, the sun will be out so I can take photos then. Total time from cutting the first piece to binding and adding the label – 41 days! 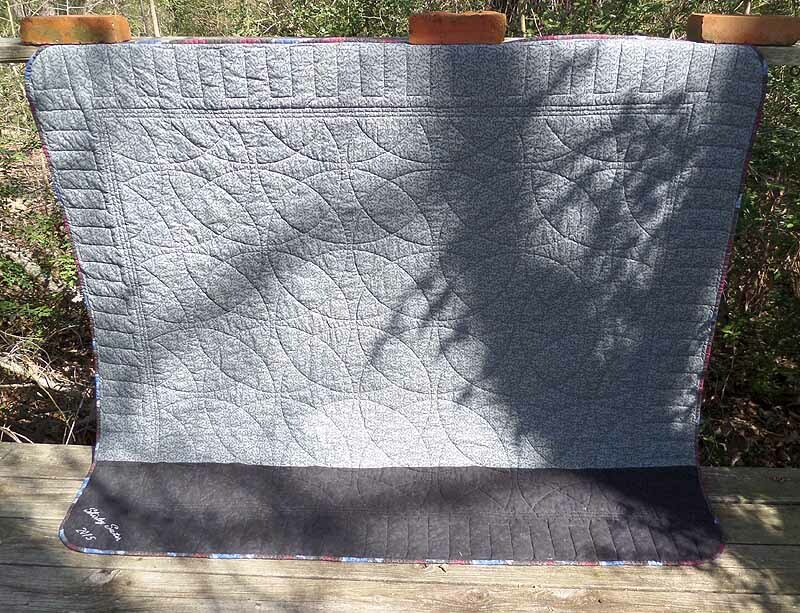 03/28/15 – Quilt gifted to my brother Hearmon and his wife Theresa as a 40th wedding anniversary/birthday/hope you recover soon gift. It was very well received and loved. It has found a good home. Copyright © http://www.shirlsu.com 2015 - 2019 all rights reserved.